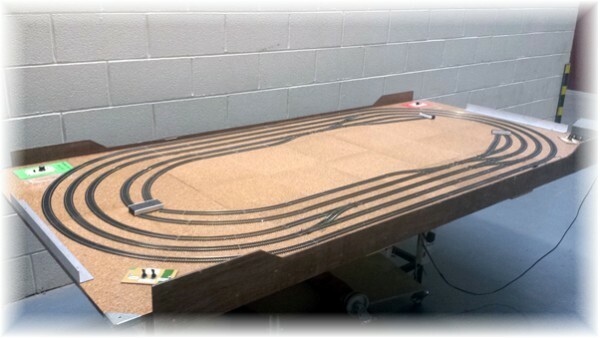 With the Club concentrating on the construction of exhibition layouts it was decided that we needed to build a test track that could be set up quickly in our Club Room for members to test their locomotives and rolling stock. Whilst the test track is not designed to be an exhibition layout it can be taken to model railway shows. It is designed to operate mainly on conventional 12 volts DC though there is provision for it to be operated using a DCC system if required. The layout has been christen "Barrie Island" by a number of our member. It is named after one of our members Barrie Summers who regularly brings his prized locomotives to test on the layout and sometimes they don't work as he had hoped. During June and July 2016 the layout was rebuilt to allow more trains to be operated. The test track layout now features three circuits. The layout gives a number of our members hours of fun on club nights.